john4jack (Corvallis, Oregon, United States) on 2 June 2009 in Miscellaneous and Portfolio. This one is for Florence and Karine. It's a shot from inside of our family room. And coming from Jack (and not an artist with this style), it seems perfect for Silly Tuesday. This is lovely. At first I didn't read your description. I was going to ask how you processed this. I think it is a beautiful image. @Cricket-Tammy: Actually I did next to nothing with this shot. It was totally for fun. Oregon is a silly place to have a Tuesday. silly...bow! @ordinaryimages: Silly; Tuesday; my wife goes nuts when I repeat myself. that's really keeping with nature! I think you are both silly and creative....I really quite love this shot!!!! Thank you again Jack for becoming Silly Papa whilst I'm away. I will try to visit every Tuesday even if I don't manage to post! @Linerberry: Again, have a great trip. That's amazing and very artistic! Excellent! I love the capture of the reflection. I don't understand why it is silly though. @Craig: Because it is so unlike me. I just don't do that sort of thing. The only reason for this shot was because it was all in the capture; no manipulation whatsoever. Lol was a bit confused then I got it. Binoculars for bird watching as well? @Nicholas: The binoculars was a sheer stroke of luck. I think this is cool Jack! @bluechameleon: Thanks; it was fun. Génial!!!! Très belle image à la fois côté jardin et intérieur! Magnifiques couleurs! Bravo Jack! I'm trying to figure out what is reflection and what is real, good job! Wow, this is great - a 'double exposure' of sorts ... and thanks for helping continue the STs. Superb ! I love the colors and these suggested reflections are beautiful ! A nice reflection, indoors and out, shot. Nice to see your lush view out the family room window. L'interférence entre l'intérieur et l'extérieure donne une vision magique, un peu comme si la pièce avec les meubles étaient disposés directement dans la nature. Etonnante mais séduisante idée. @Evelyne Dubos: It was all by luck; nothing really by design. I noticed the reflections so vivid in the window and I wondered how they would capture; so I fired away. I find it quite creative than silly. But yes, as you said it doesn't match your style of shots with no room for imperfections. @Ajay: What I meant was that I don't do composites. Plus, I am not nearly as creative as I would like to be. I´m havinga hard job finding this silly !! It´s far too good for that !! excellent shot ,jack !!! wonderful idea ! if this is Jack's idea of silly, I wonder what John thinks of it!!! Nice catch with that reflection...before I read description, I thought you were building a virtual tree house!! nice silly Tuesday, not silly at all, but nice light and reflection ! That's a good idea Jack , I love the composition and the colors . Tough to figure out what's what in this one. Silliness rules! @willow: "Tough to figure out what's what" - now that's the story of my life. I love the inside-outside feel of this shot - somewhat reminiscent of Rabbit's Alice In Wonderland style. from the reflections it is clear that you are at home in the woods. A beautiful shot. The reflections are amazing of course. @Steve Rice: It was a Sunday morning, and I remember how dumbstruck I was when I saw the reflections in the window. The results turned out better than I had even hoped. Really nice through the window capture. The colors and clarity are exceptional. @sherri: Thanks, Sherri. Wish that you were on Am3. The shot on your blog right now is perfect for Silly Tuesday. Ooh, I do like this a lot! 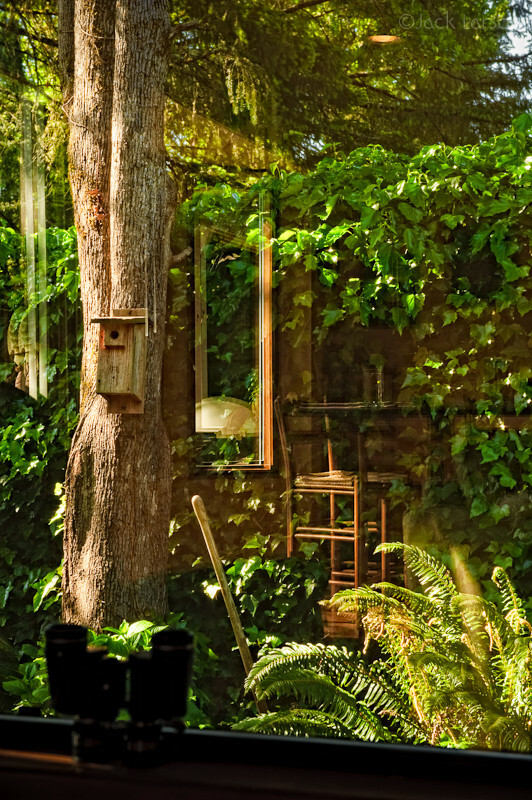 It's like inviting nature into your livingroom - something I'd love to do! This is a very cool shot. Sharp ! Luminous ! Rich ! @k@: As I said, this was for you and Flo. A great capture Jack. I like it. It works for Silly Tuesday. Clever composition and good silly fun photo! Superb! as a inversely! outside or inside? Or image in the image! I like!! Great shot. What an lovely place where you live. @Suzanne: Thanks, Suzanne. It is a lovely place; there are lush gardens all around the house. @k@: You and Flo do such a great job with that which pushes the edge of the envelope. a very great shot, wonderful reflexion !!!! Kind of expect to see Tarzan. @Richard_Irwin: Wish that I could say that the placement was intentional. wow...greenery effect! soothing in our eyes. Wonderful shot! Pretty artistic. Good that someone washed the windows! @jeff (aka dogilicious): It wasn't me. this is great !! BTW. your image of bluebells yesterday is SENSATIONAL !!! Oh I really like it. It's like the best of both worlds. Cool shot. a STUNNING shot -- i love indoor / outdoor shots -- and this is a superb rendition!! gorgeous saturation and bright color and lighting!! Fantastic shot! The clarity is amazing! Love the delicate reflections in the window. Nice work! Very well seen. Excellent reflections. Good job!